0.2 The best National Parks in Sri Lanka to see Wild Leopards? 0.3 The quest to see a wild leopard at Yala National Park, Sri Lanka | 10 safari’s later…. 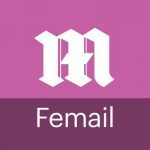 0.5 Alternatives to block one? 1 How to see a wild Sri Lankan Leopard? 1.4 How many leopards did we see? 2.1 best leopard safari company in Yala National Park? The drawcard to Yala National Park is its claim to fame – having the highest density of leopards in the world. It really should be protected in accordance with such a title. Unfortunately, Yala is known by a less positive name – “The Circus” – it is an apt description for a reason. After seeing this unethical behaviour, I made it my mission to find an ethical tour operator to have a real safari. By the time I had realised my mistake it was too late. We were leaving. Leopards were calling my name. Luckily, I properly investigated and emailed a couple of well-regarded safari companies. In the end, a couple of operations stood out. One, in particular, was Noel Roderigo’s Leopard Safaris stood out. Some of the jeep drivers speed and are dangerous. in 2016, a female leopard was killed. Tragically she was pregnant with 2 leopard cubs. That behaviour is not only really sad for the leopards, it is also devastating for the entire population of Sri Lankan leopards. They are just holding on as it is. I was talking to a number of people about feeling a level of guilt going on safari. Ironically, they said – the animals are in more danger without tourists visiting. The sad truth is many people still want a leopard skin or elephant tusk. The leopards and other animals face the danger of man in more ways than one. Hunting is still a real risk to these animals. The best National Parks in Sri Lanka to see Wild Leopards? We went on many so many safaris during our time in Southern Province, Sri Lanka. In the end, I think the count was ten different days. Some days it was a full day of safari, but mostly it was half day game drives. Some safaris were in the morning and some in the afternoon. The first national park in Sri Lanka we visited was the sleepy but great Udawalawe National Park namely to see elephants. It was a success! Then following the floods in 2017, we had to move from Tangalle. We ended up staying near Tissahamara (Tissa) and Hambantota. 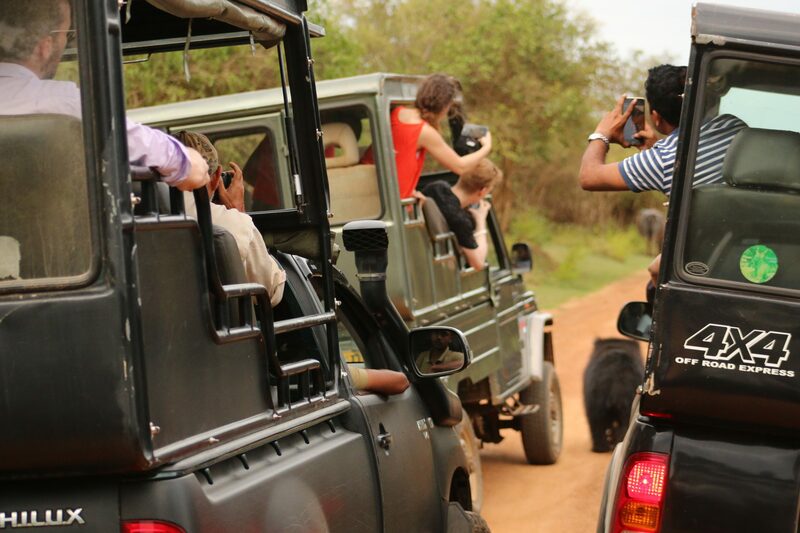 Our first trip to Yala Park was during our time in Hambantota and we had one just safari. We saw no leopards but saw an even rarer animal – Sri Lankan Sloth Bear and had a beautiful experience with a newborn elephant calf. We then went to Tissahamara, initial, we were going to be for one week. During this time, we went to Yala National Park a few times. The leopard still eluded us. I decided we should not leave the area without seeing a leopard. We had seen prints, but that was it! The quest was on! The quest to see a wild leopard at Yala National Park, Sri Lanka | 10 safari’s later…. We wanted to see a wild Sri Lankan leopard. Well, when I say we. I mean, me. I really wanted to see a leopard. Our one week stay in Tissa was extended to three weeks. I initially and foolishly tried to go on ‘budget’ jeep safaris in Yala. I booked with random safari operators and set out early each morning. Some mornings it was 4 am, some 5 am, sometimes 6 am. It was very much ad-hoc and we had varied experiences each time. The first few safaris we went to Block One to try our luck. We did see eventually see a leopard. I think it was our 4th safari. Unfortunately, the first experience was horrible. Essentially we arrived and the driver got a call to say a leopard was spotted on the other side of the park, in block one. We set off and drove for over an hour. We arrived and there were already about 20 jeeps in the area, near the leopard. We saw very little. It was horrible. The jeeps were all loud and trying to get a better view. It involved loud revving, mobiles ringing and finally, jeep drivers started to yell. One jeep was screaming at another jeep to move along. Then he beeped his horn. Can you believe it? There is no order and jeeps try to go to the best view from all angles. Finally, someone got out, not ideal, and said get in a line. We got to see a glimpse for about 1 second from about 50m away. Amazingly, the leopard just sat there. Eventually, the Sri Lankan Leopard I had so longingly wanted to see got up and wandered off. Pretty much as soon as we got to see him. You cannot blame him, I would too with all that noise. At a loss, I thought we need to go to the less busy blocks. So, we tried block III and V. In comparison to block I, these blocks are dead quiet. We still had no luck seeing a wild Sri Lankan leopard. We did have a lovely time there though as it is so much calmer. The area of block V was really dramatic. There was a dry lack that looks like something akin to a horror movie set! Each year the lake fills up and is home to many water birds. Although, there was a giant dam next to it, so I’m not convinced it does fill up like they said. Either way block 5 at Yala National Park is nothing like the frantic nature of block 1. There are fewer leopards in block five when compared to block one. Further, block V leopards are less habituated to jeeps and people so are more likely to flee. If you do get lucky, you won’t have to share that experience with 26790753 annoying jeeps!! In my books, that is a major win! Back to Block I and back to The Circus. The guesthouse we were staying at was in shock at how many safaris I was willing to take and saw how disheartened I was with the random jeep game drives we had to date. I asked them to help me find a good tracker. They asked around and one of their neighbours knew someone who was an experienced guide and skilled tracker. The only issue was he worked for the Park. He had retired from being a guide. He had a driver he used for friends. Off we set, again, I was full of hope! Ten minutes after this encounter. Our guide who was an experienced tracker saw some fresh footprints in the sand. We very slowly drove up and down the road looking for the leopard. We stopped at the point the prints stopped. At this point, a jeep went screaming down the same road destroying the prints in the road. Luckily, not 20 seconds later we turned the jeep around again and I saw him! Me!! He was sitting in along the branch of a tree in the shade. I nearly cried because I was so happy. We had a good 10 minutes watching him over about a 30 minutes period. Luckily no other jeeps arrived. The photos I got were really ordinary because I was actually living in the moment! How to see a wild Sri Lankan Leopard? The main difference was having someone in the car that knew what the heck they were doing! The first 4 or 5 we had a government guide, or in a couple of cases just the driver, it was hopeless, to be honest. Once we realised we needed a proper guide and we got a specialised tracker, that made all the difference. We went on 4 or 5 safaris with him and saw 5 leopards in total with him! This was the best experiences by far as we when you are the only jeep in the area. We had another lucky encounter all alone with a Sri Lankan Sloth Bear. We went around the corner and there he was. There is a very large amount of luck in seeing a Sri Lankan Leopard in the wild, in Yala National Park. You need to be at the right place and at the right time. If you go on one safari and see a leopard, you are luckier than most. You need to organise to go a number of safaris to increase your chance of a wild leopard encounter. How many leopards did we see? In the end, we saw 5. The experience, one that should have been magical and special, was mostly overshadowed by the uncouth and dangerous behaviour on 3 of those occasions. It was equally disappointing to see the behaviour by the jeep drivers, tourists and locals alike! Why is it known as The Circus? Don’t add to The Circus at Yala National Park. This photo shows Yala on a good day. I would hope that the Sri Lankan government implement tough penalties for bad behaviour and cap the number of jeeps per day. I do not hold my breath considering last year the number of jeeps able to enter Yala went up to 500 per day, not down. best leopard safari company in Yala National Park? If you do not have time to read all about why you need to carefully choose an ethical jeep safari company I can cut to the chase. You need to look at the company and ask yourself a few questions. 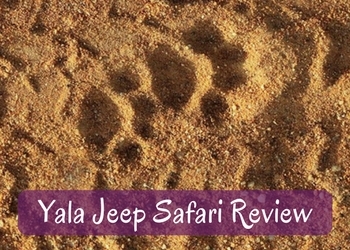 Use this checklist before booking with any of the safari companies around Yala. Do they look like they are educated about wildlife? Are the jeeps well maintained?I did go on safari after many wasted hours on game drives with little to no knowledge of tracking or even similar things like how many big cats are in the park? Click on the picture below to read about one of the best jeep safari companies in Yala National Park, Sri Lanka. Except for our safari from The Shangri-La Hambantota we had relied on our safari drivers to know where to go or where to look. It often felt like a random circuit, and I think looking back it was. We drove around, usually at speed and saw very little. Often, we would leave the park to be told: “there was a leopard spotted”. It felt like it was never our lucky day! Still, we persisted. There are so jeep drivers and few experienced guides. 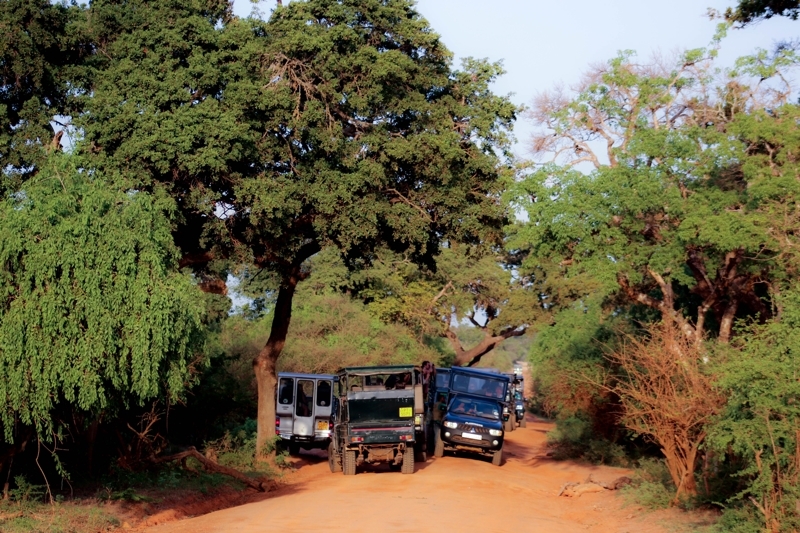 Don’t make my initial mistake by wasting both time and money on ‘budget jeep safaris in Yala” – pay for an experienced and ethical safari company from the beginning, or skip it altogether. You do not want to add to The Circus at Yala National Park.